THIS ITEM IS NOT AVAILABLE AT PRESENT. WE WILL NOT BE GETTING ANYMORE Star Trek LCARS Magnet 2-Pack. From the Star Trek collection by The Coop. 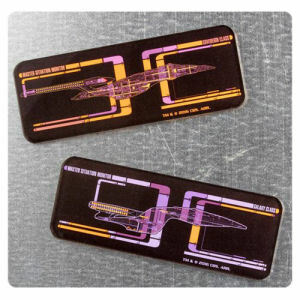 Star Trek LCARS Magnet 2-Pack. Made of acrylic. They feature full color graphics of the LCARS from Star Trek. They each measure 4 inches wide by 1.5 inches tall. Ages 13 and up. The Coop Star Trek Magnets shipping from Canada. No Surprise Border fees or Customs!